Rev your engine with a CAO Flathead cigar, a line inspired by hot rods and pinup girls. 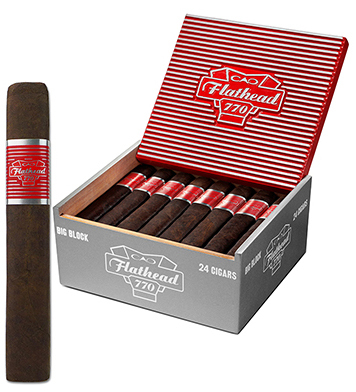 Firing on all cylinders in both looks and flavor, the box-pressed Flathead cigar is hand-shaped to produce the flattest of flat tops and features a dark and oily Connecticut Broadleaf wrapper surrounding a blend of Nicaraguan and Piloto Cubana Ligero long fillers bound in Cuban-seed Habano Connecticut. In keeping with the muscle car theme, each format is named for an engine part and boxed with a removable lid intended to be used as wall art*. Additional wall art comes in the form of a collectible pinup girl flysheet* enclosed in the cigar box. That flavor though! The rich and meaty, medium- to full-bodied Flathead shoots off the line with notes of dark chocolate, cream, molasses, fruit, pepper, and leather and just gains speed from there, so don't let the novelty packaging fool you. The CAO Flathead is a seriously enjoyable cigar. In fact, the V660 Carb was Cigar Aficionado's No. 3 Cigar of the Year in 2015. * Excludes the Sparkplug format, which is packaged similar to spark plugs of old with each Sparkplug cigar individually boxed within a cardboard display box.